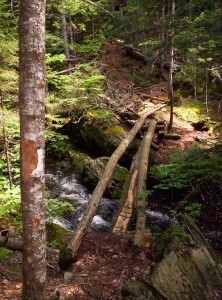 Andover, ME to Gorham, NH: I dare you to step across this line! After a full breakfast of pancakes and an omelette at the store (it’s a diner as well as a general store), I get back on the trail, but not before being told that there’s a nice storm coming through in the afternoon and that it might be wise to consider my schedule once I’ve reached the first shelter. 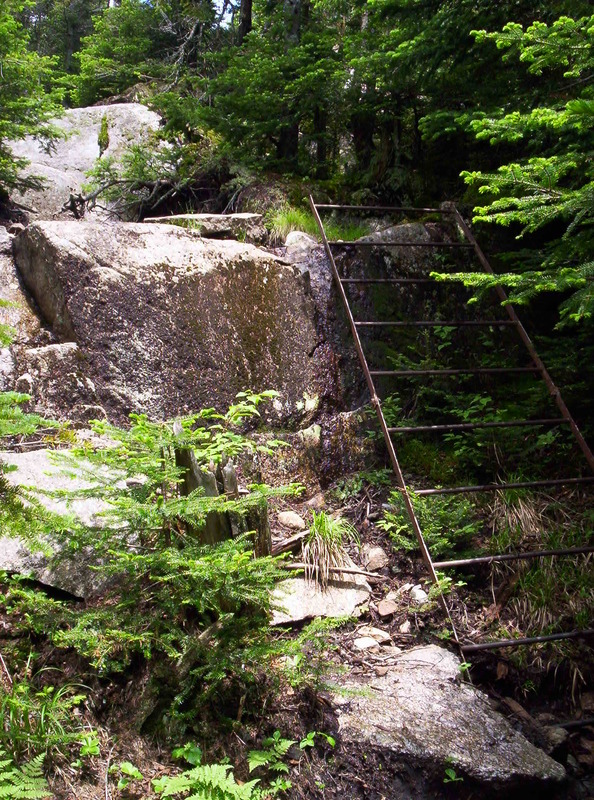 The first big trail feature of the day is Moody Mountain; by Maine standards it’s not especially big (2440 feet), and it’s a reasonably nice hike up the side. By the time I arrive at Hall Mountain Lean-to on the other side it’s early afternoon and the rain hasn’t come; since it’s ten miles to the next lean-to, I decide to stop early and avoid getting wet. Given the time, it’s not surprising that it takes a few hours for anyone else to show up. By the end of the day I share the shelter with three other people: Laserchuck (apparently it’s a sailing term, not associated with speediness) doing a northbound thru-hike, Sunday going southbound (I apparently just crossed his path back in Monson when he was laid up for a week due to injury), and a guy on his second day out doing a section hike north. Since it’s so early and I’ve got a little extra food due to the Andover layover, I cook and eat two dinners tonight. I end the day, as I’ve nearly always (sans a night or two in hostels, to the best of my memory) done so far, reading a bit of the Bible I’ve carried with me. Typically I’ll read a few chapters before going to sleep; I started at the beginning of Romans and have been working my way forward from there (as of July 22 I’m in 2 Timothy, for what it’s worth). Sometimes, however, I’ll get sidetracked with something like Saul’s reign or something else; tonight it was the book of Ecclesiastes. (Yes, I did say “book” — it’s only eight or ten pages, not too long.) Having read it, I have to say it’s by far the weirdest passage in the Bible I’ve ever read. Anyone out there done any studying of it? I can’t imagine it’s possible to get too much out of it without having some sort of “guidebook” to help you through it and its content, to be honest. Whee! Fourth of July! Happy Independence Day! I need to start writing these entries while I’m on the trail; it’s now (the 22nd) nearly three weeks since I actually finished this day, and things are starting to get hazy. I get a relatively early and quick start out of the lean-to and head over to the next one, Frye Notch Lean-to, just over ten miles away. 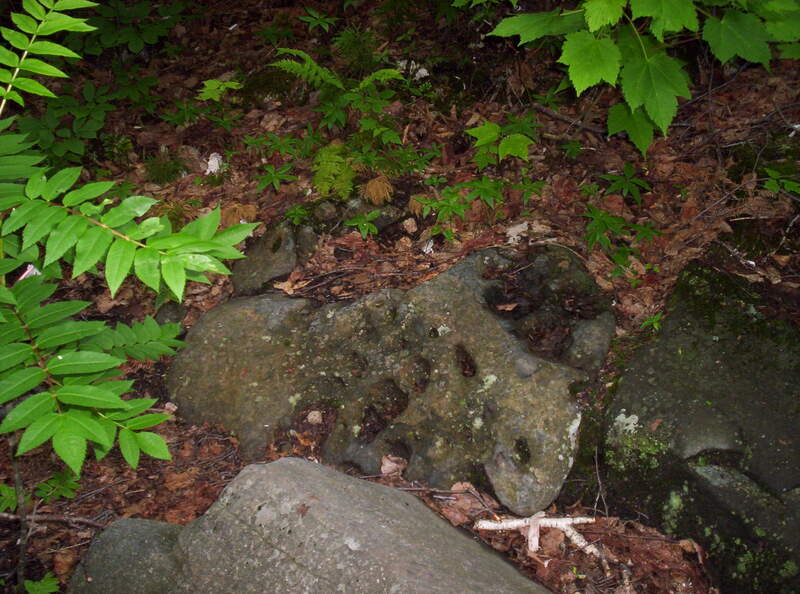 Along the way next to Wyman Pond I meet a sectionwise thru-hiker, Ol’ Graceful. He says he’s on his seventeenth year of section hiking and will complete the full thru-hike with this section. To be honest, I find this achievement in many ways more impressive than a one-shot thru-hike like I’m doing; consistently committing time every year for that long to doing sections is something I can’t imagine I’d be willing to do, to be honest. There are too many other things I’d want to do (cross-country bike trip, I’m looking at you!) for me to be likely to continue doing it year after year like that. There’s also the conditioning: getting in shape again every time you start has to make the hike far less fun than it would otherwise be. As it turns out, the 3.5 miles to the next lean-to over the mountain are initially easy going, temporarily very difficult (right up a sheer rocky slope), a reasonable stroll down and over to the second of the mountain’s peaks, and another steep descent to the lean-to. Since it’s the 4th I consider making the shelter, packing up a few things, and heading back to the top of the second peak (1.6 miles round trip) to try to catch fireworks, but unfortunately the peak is wooded, and three miles to get to the top of the first, clear summit and back (in the dark!) is too far, so I stop. Tonight’s shelter is where I finally meet Spanky, he of the long shelter register entries accompanied with Bible verses (Sunday referred to him as “preacher-man” once), website, and a fairly relaxed pace. Spanky did a southbound trek in ’02 as well (his home is near Springer, hence the direction), and he says he’s doing the hike and then living out the rest of his life with his wife. He’d get along with my mom well, because he talks quite a bit. (I’m not much of a conversationalist, but I’ll talk when there are other people around or they try to draw me into discussion, generally.) 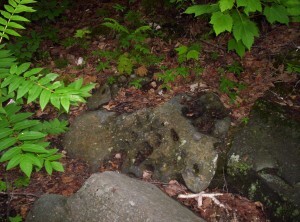 We see a snowshoe hare run across the clearing in front of the lean-to; I lust for a gun, a license, and hunting season. 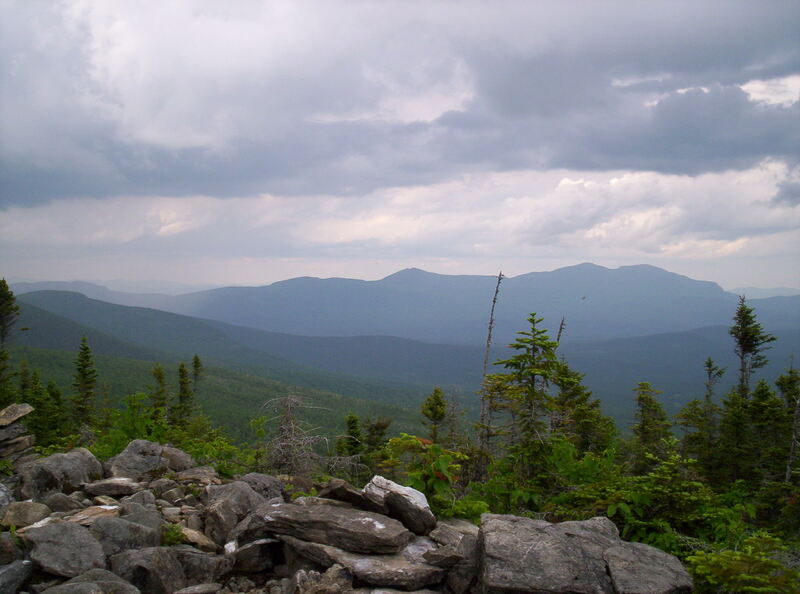 It appears it’ll just be the two of us for awhile, but eventually four or five northbounders walk in from Carlo Col, 16.5 miles south and just before the NH-ME border, and we share the shelter with them. One’s British and mentions having made an entry in the next shelter’s register noting “Happy Insurgency Day”, which I find moderately amusing. 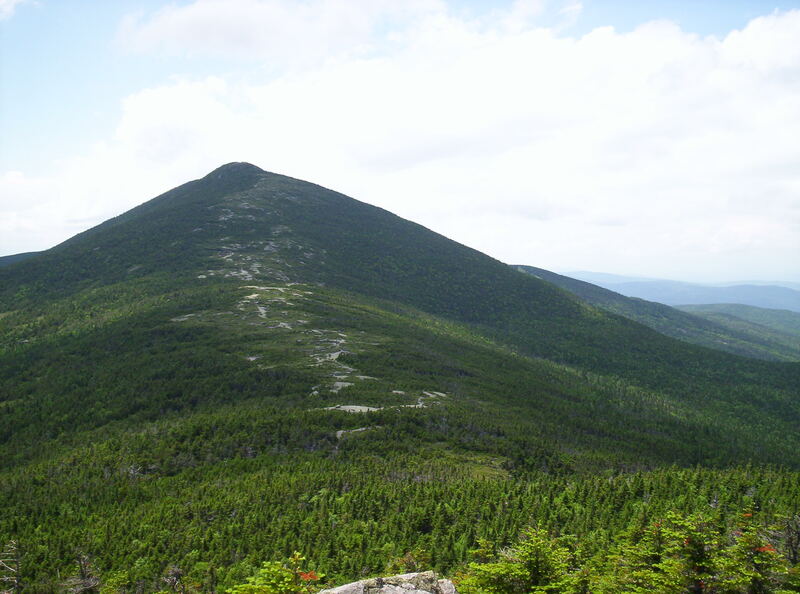 Today is the day that I finally meet that most vaunted adversary along the Appalachian Trail, Mahoosuc Notch. Some thru-hikers describe it as the most difficult mile on the entire trail; I have customarily reserved judgment and set no expectations regarding it. 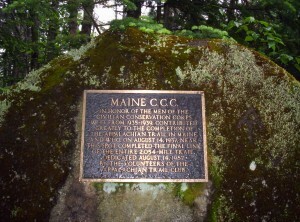 Today is the first day of the trail where I’m not in Maine ATC land any more. Once I pass Maine 26, I enter AMC land. The Appalachian Mountain Club is old — older than the Appalachian Trail itself — and is probably most closely associated with the White Mountains. Today also marks the start of an abomination upon the trail: fee sites. The AMC is a non-profit organization, but frankly, from the way they operate, it’s not obvious. Most sites in the area of the trail they maintain have an overnight use fee of $8; even worse, camping is prohibited within a quarter mile of all such sites (to preserve the land, which is probably accurate but is a stunningly convenient excuse), and they require non-site camping to be off the trail by 200 feet, so you can’t just hike until you find a nice place to stop, generally. 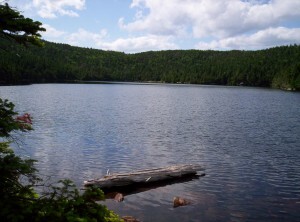 I arrive in Speck Pond to catch up to Spanky, who says he’s stopping for the day. I’m still aiming to finish the Notch and get to the shelter on the other side of it, so I continue on. I’m starting to run low on trail snacks now, which isn’t good; I have plenty for meals, but a hiker can’t survive on just meals unless he’s willing to make very long breaks to cook meals on the trail — not good for hiking pace. Spanky gives me some of the food he’s carrying; it’s not trail food, but it’ll help, and oatmeal can be trail food in a pinch. 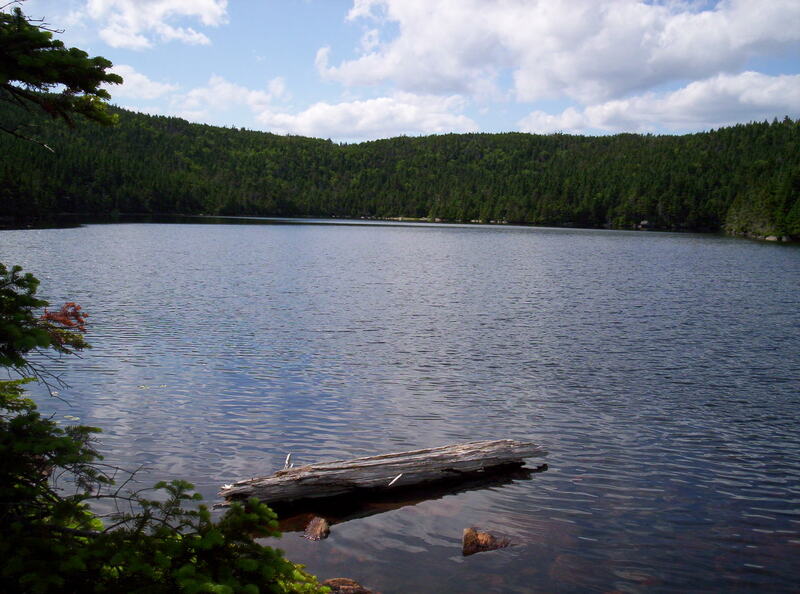 First, however, I have to hike down from Speck Pond to the bottom of the Notch; that hike goes slowly, as all descents do, and I finally decide that when I reach Gorham I’m going to get a set of hiking poles (really could have used them through Maine, but a bit late for that now). Finally, I reach the Notch. Mahoosuc Notch is about a mile of ravine traveling over, under, and around house-sized boulders. It’s sheltered from the elements and contains scattered patches of ice/snow year-round, and the temperature’s easily twenty degrees lower than elsewhere. My pace slows quite a bit, and I have to plan my footing and route much, much more carefully than I usually do. I can see why they call it the most difficult mile, but frankly, after going through it, I don’t understand that sentiment. The only proper way to approach this is to budget a few hours and to look at it as rock-hopping through a giant’s playground; it’s absolutely a blast if you don’t care how little progress you’re actually making. 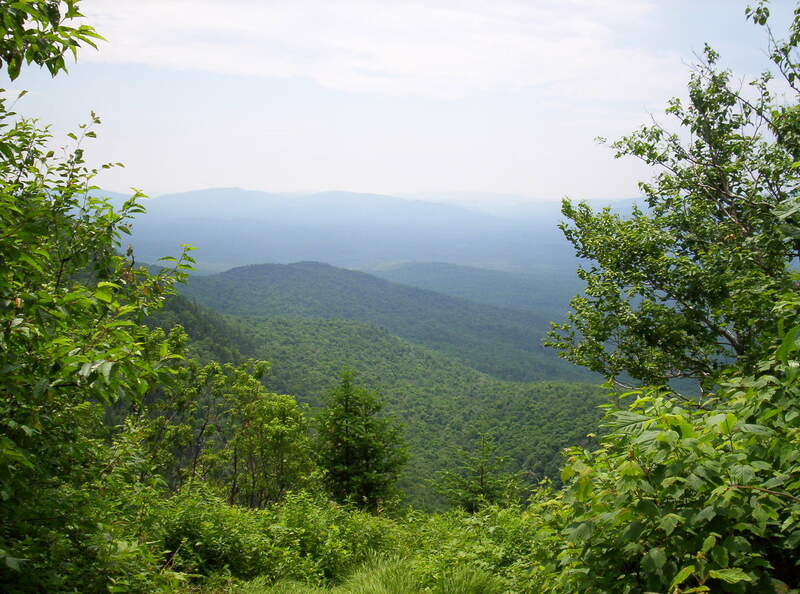 Of all the miles of trail I’ve hiked, both on and off the Appalachian Trail (which at this point are of comparable magnitude, although probably not equal), this mile is by far the best mile of trail I’ve ever hiked. If you’re ever up in this area, give yourself a day to do it and hike through Mahoosuc Notch; you’ll be glad you did. The Notch is very cool year-round, although winter must be worse than summer. I tried to make a snowball, but truth be told it's more ice than snow. The Notch progresses slowly. Spanky apparently decided to move on, and he catches up to me perhaps halfway through the Notch. We pass by a dead moose carcass, which the AMC has chosen to leave there to let it decay naturally. It’s a very powerful odor, and between that and my route-finding skills taking me a bit away from it I end up not taking a picture of it. Eventually, after many false finishes, we exit the Notch. It’s pretty late at this point — at least 7 or so — and there’s still a mile and a half to Full Goose Shelter. Spanky’s headlight broke in the 100-Mile Wilderness, and it’s only dusky, so I let him borrow mine as I carefully and slowly step up Fulling Mill Mountain. We reach the top just as it gets dark, and as we only have one working light (and an underpowered one at that for night-hiking) between us, we stop atop the mountain for the night. I pull out a meal and eat; the stars are awesome tonight. 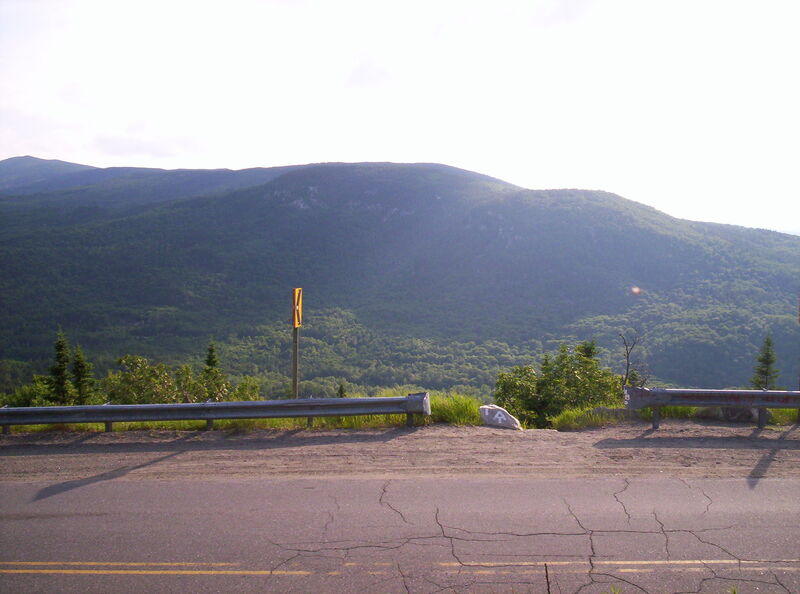 Spanky raves about how he wanted to sleep atop a mountain in Maine and finally got the chance on his last night in Maine. 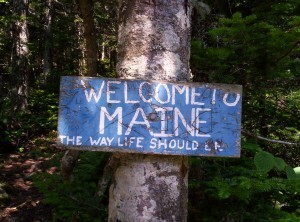 We’re 5.4 miles from the border now, and I can’t wait to see the back side of Maine! I wake up around 6:30 or so to sunlight and dew; conveniently I’d put my sleeping bag inside my tent, used bivy-style on the rocks atop the mountain, so it’s not very wet. Sunlight dries things pretty well atop the rocks on the mountain, and I eat oatmeal for breakfast. A few northbounders — Topo, Cookie, and Kirby are the names I remember — pass us pretty early. Topo asks how many packets I eat a day; I’m currently at around two, and she says she and her companions are up to five now. The morning progresses at about an average pace over a couple mountains. The trail to the top of one is pretty amusing, because, standing atop the highest point, I can clearly see the trail making a 30-degree bend to reach it — no taking the shortest path between two points around here! Trail snacks are now almost entirely depleted, and after passing the state line (NEW HAMPSHIRE!) I have to stop and cook a dinner for energy. Another five miles down and I reach Gentian Pond Campsite, closely followed by a southbounder named Moose. He’s hiking with a girl named Duckie who apparently also attends or attended MIT (or maybe just lived in Boston? 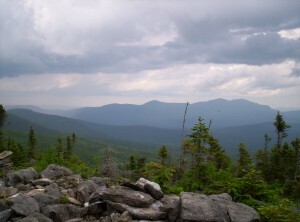 memory hazy), but she doesn’t catch up by the time I get there, and given my snack situation I want as short a trip into Gorham the next day as possible, so I continue on another 4.9 miles to Trident Col Tentsite after being given an energy bar by a hiker in the shelter. It’s a good thing, too — at this point I’m down to eating powdered hot chocolate dry for the energy. I leave Gentian at 19:30 or so, and it takes me until 22:30 to get to Trident, the last two hours of it in darkness save for my flashlight at a snail’s pace. Thankfully the blazes are pretty thick, so it’s not too hard to follow the path (although I do stumble about twenty feet down the trail to the tentsite without noticing until I look up to see a blue blaze rather than a white one). I make and eat dinner and fall asleep quickly, hoping to wake up and get into Gorham early. My plan to wake up early fails miserably, but at least I’m not sleepy. I eat a breakfast and a dinner as preparation for the walk in, still mostly snackless save for some hot chocolate packets, and hit the trail at 10:30. I make reasonable progress down the trail and don’t hurt too much until the last few miles, when I’ve depleted my energy from breakfast and hot chocolate. The last miles really drag, and it’s a relief to finally hit US 2. 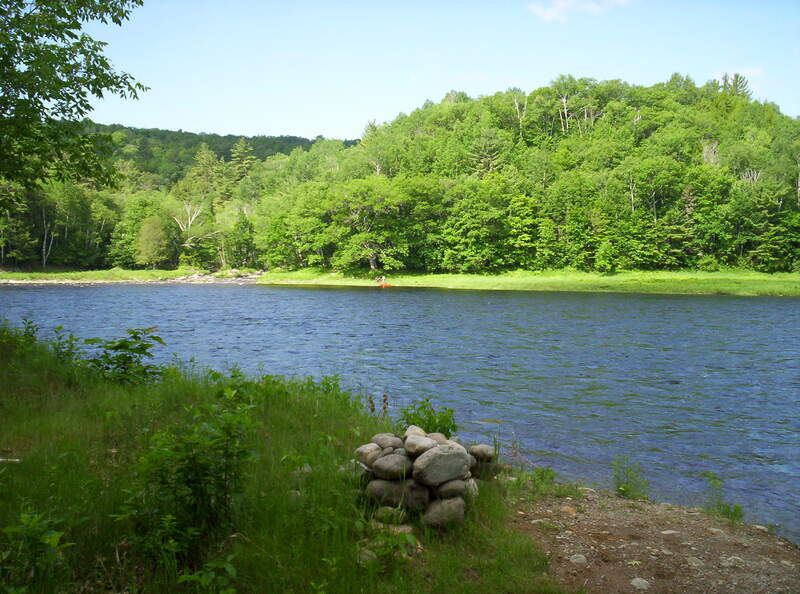 My target for the day is White Birches Campground a mile and a half towards Gorham, which has a hiker bunkroom and some ability to shuttle into Gorham. I start walking, thinking to look for a reasonable place to sit and put out the thumb, when a white van stops and picks me up. Turns out the guy lives at the campground and drives hikers around a bit in his spare time. I get to the campground, drop my backpack inside, say hi to yet another hiking couple named Dan and Leah (from Texas or thereabouts, married since December, recent college graduates, were going to go as the Honeymooners but the name was taken and so just go by their real names), whose entries I’ve seen as I’ve hiked the trail, and get a shower. Once that’s completed, I get a ride in to a Shaw’s grocery store between Gorham and Berlin, where I pick up 1.75 quarts of mint chocolate chip ice cream. Ice cream containers have had horrible size deflation recently; I wanted a half gallon, but the only option for half gallons was Shaw’s ice cream, and they didn’t have mint chocolate chip, sadly. After eating that and reading several of the Federalist Papers, I order a pizza from Mr. Pizza in town, eat that, and head to sleep. The plan in the morning is to head into town, eat a breakfast at Welsh’s, hit up the library to write some updates, get hiking poles and fuel, and get groceries for the next leg of travel. The biggest change going forward, now, is that unless I bivouac in non-site sites, I’m going to be paying camping fees when I stay at campsites. There are good reasons for the fees: they sometimes support a site caretaker, help defray the costs of dealing with human waste (privies aren’t all that cheap to operate in the middle of nowhere and often involve chartering a helicopter periodically), and advance other AMC goals. That said, nearly all the rest of the trail is free, so it comes as a bit of a slap in the face. Many thru-hikers are fairly antagonistic towards the AMC, and (speaking from outside AMC-land now) I can understand why, although I’ll probably talk more about that in the next update. 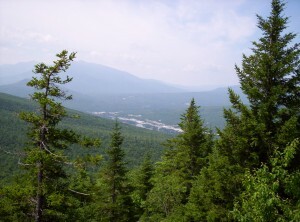 Right now I’m in Hanover, NH (Dartmouth College land) heading into Vermont; I’m guessing my next stop with Internet access will be Rutland, but we’ll have to see, since I might not have time to take advantage of it. The next morning I wake up, finish off the second pound of strawberries and apple juice I’d purchased yesterday, add some photos to the first trail journal post. Incidentally, the laptop the hostel has for our use is running Firefox 2; I download and run the install program for Firefox 3 (released to the masses during my time hiking, and with a world record to its name, no less!) to find — gasp! — that the laptop is running that marvel of stability, Windows ME, while Firefox 3 requires Windows 2000/XP or newer. No upgrade for this machine! :-\ No Unicode love for the Firefox 2 users, either. I then hit the trail with The Honeymooners at around 9:30 or so. I immediately confirm a fact I’d suspected yesterday: I bought way too much food when I did my shopping on an empty stomach. 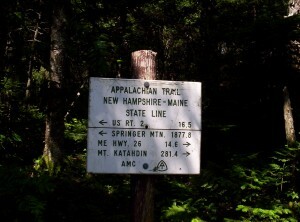 Best of all, we’re starting to hit the more mountainous part of Maine, and my pace becomes abysmal. Today I’d planned to hike to Spaulding Mountain Lean-to, a distance of 13.5 miles. Instead, I reach the Crocker Cirque (fun fact: the word cwm is defined by the official Scrabble dictionary as “cirque”; it is actually not a “Scrabble word” for me, because I’ve seen it labeling one of the features in the map in Jon Krakauer’s Into Thin Air) tent site, a grand total of 7.3 miles up the trail, of which the last mile or so is a rocky downward scramble — the absolute worst thing possible for my making any sort of speed. The silver lining of this overfull pack, however, is that I eat very well today: two apples, three tortillas with peanut butter and honey, and a lot of gorp (with M&Ms added, naturally), and that’s just on the trail. (I’d planned to eat the bagels and apples anyway since they’re heavy, but I did eat them a bit more hurriedly than I’d expected.) Dinner is a Knorr chicken meal to which I add real chicken! Apparently, in addition to tuna in a pouch, there also exists chicken in a pouch! The miracles shall never cease. Mine is a lightly-garlic-flavored breast, although I hear they also sell unflavored breasts (not in Stratton, it seems). It goes pretty well, all told, and I sleep sated, again on a tent platform with a rigged-up staking system for my not-freestanding tent. The next day goes, if anything, worse than the previous day. I start the day pretty late, eating the remaining apples I’d started with and a few of the bagels I’d brought (which actually contain a pretty hefty number of calories, a fact I’d not noticed before in normal life). I’m still carrying far too much. 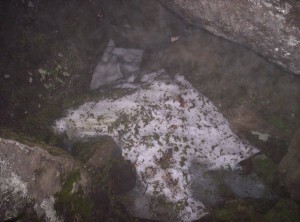 The day ends just short of six in the evening at my target for yesterday: Spaulding Mountain Lean-to. I note in the trail register that The Honeymooners did stay last night here, and I make a note in my entry warning hikers not to buy groceries on an empty stomach. The lean-to is a full house tonight: a couple on a three-day trip, it being the weekend and all, and a bevy of northbounders (five, the most I’ve seen yet in the same place). The northbounders are Crazy Legs, Water Bear, Marathon, Strides, and one last person whose name I’ve sadly forgotten. Dinner tonight is another modern miracle: beef Knorr with dried beef slices (again from a pouch). The slices are, of course, heavily salted; the instructions on the label suggest running the slices under warm water for fifteen seconds to wash off excess sodium, which I don’t do, much to my chagrin: this stuff’s wicked salty, nearly to the point of not being readily edible. The northbounders remark on the quantity of food I have (with good reason!) and say the bear canister I’ve been using on the trail is superfluous, with bear lines or boxes at every shelter (and perhaps tent site as well? I don’t remember the exact wording) where you’d actually need them. Given my pack weight now, I’m inclined to agree with just about any suggestion that reduces its weight. One of them is from the upper peninsula of Michigan near Marquette (I believe the exact town mentioned was Big Bay, but I’m not 100% sure). He worked for the National Park Service on Isle Royale several years ago doing wildlife surveys, among other things, and once while hiking with a partner saw three gray wolves approaching him. He called to his partner hiking fifty or so feet ahead of him, and when the partner turned they’d all scattered. Since this was a bit unnerving, they quickly continued on for another mile or so before stopping to regroup. Then, on a whim, they checked whether any of the wolves had been radio-tagged: turns out one of them had been, and furthermore, it was only thirty or so yards away and had followed them the entire time. According to him, this was at the time the closest incident to a wolf attack in NPS history (!). 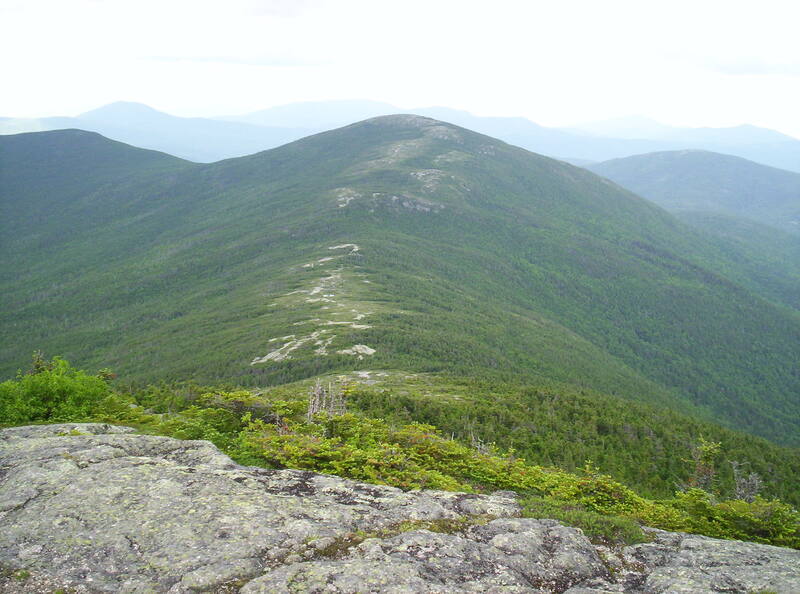 Another of the northbounders (perhaps the same one, perhaps a different one, perhaps the one who would then quite aptly have been named Marathon) has so far logged three forty-mile days on the trail during his thru-hike. I doubt I’ve broken fifteen more than a handful of times, ever, so this is an almost-incomprehensible feat. We shall see what flatter trails do to what I consider achievable. I get a nice quick start this morning in 75 minutes from in sleeping bag to hiking down the trail; I’m pretty sure it’s my fastest start yet out of a shelter (out of a tent is naturally slower), but I haven’t been paying much attention so far. The first few miles are across reasonably flat ground, and I make nice time — for a moment I become optimistic that I can do well for the day. The first real stop is Poplar Ridge Lean-to at eight miles out, occupied by a couple guys drying out tents and other gear. I talk for a second to them (one has the same Eureka Solitaire tent I have), and they mention an under-construction tent site (not listed in books yet, of course) a little further down the trail between mountains — they inadvertently stayed there the previous night to be awoken by a trail crew coming in to work on the second of three days installing a privy. I then continue down the trail a touch and stop to use the shelter privy before heading along further; it’s too early and too short to stop here for the night. I pass over Saddleback Junior and stop at what I think is the nascent tent site, although it’s not marked by the orange tape that had been mentioned as denoting it. There’s a large number of boot prints from the south which stop right at the place where I turn off, so I think I’m there, even if I can’t find the aforementioned half-built privy. The site itself is pretty nice; it’s not too buggy, although I pull out my rain coat to reduce the need to ward them off, set up my tent in a nice cushioned spot, and start making dinner. While making dinner, I hear some loud grunting noises from the east by the trail — turns out it’s a porcupine about ten or fifteen yards away! I don’t know for sure it was one since it was dusky, but it looked a lot like one; since I’m in the middle of dinner preparation the last thing on my mind is taking a picture — I’d rather he leave me (and my smellable goodies) alone now. It turns out I’d stopped short of the nascent campsite, which I pass a bit down the trail this morning. Nobody’s there, and the privy looks complete, so sadly I can’t celebrate its existence; it looks pretty awesome. 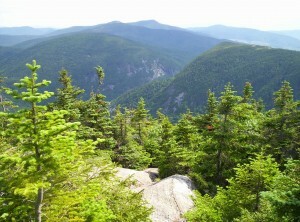 The morning continues with a nice hike up The Horn, yet another mountain in Maine. 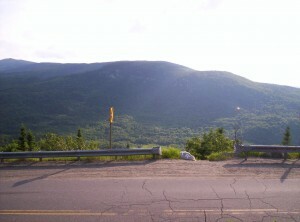 Saddleback Mountain itself follows next, and it has good views all around. I fully expect the ALDHA and the Maine ATC to rectify this serious omission from their literature at the earliest time possible. 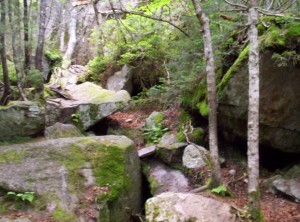 I continue down the trail toward the next lean-to, Piazza Rock Lean-to. Along the way I pass a guy wearing bug netting trimming along the trail; turns out he’s the lean-to’s caretaker out for a bit of maintenance. 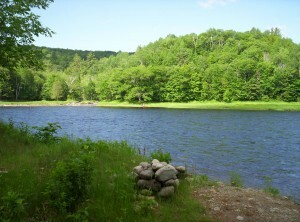 Since I’m hoping to make it six miles further that day to Little Swift River Pond Campsite, I continue on. How about a nice game of cribbage? 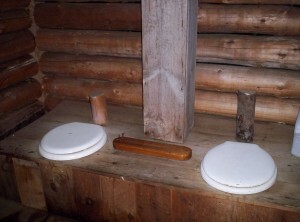 Incredibly, while using the privy, I run out of toilet paper. I’d resupplied with a small partial roll in Stratton, but somehow, due to a ridiculously (but not perilously, as I note in the shelter register) active bladder, my supply (intended to reach Gorham) is already depleted! The options aren’t good. I’m right near a road into Rangeley, so I could hitch in in the morning just to get toilet paper, which would eat up a good hour, and that’s if I get lucky. I could experiment and see just how well leaves work, but I’d rather not find that out until I’m forced to do so. I also have one last option: see if the caretaker has a phone I could borrow to call for some to be delivered by friendly people in the area (there’s a nearby place with five people willing to put up and party with hikers that would probably work). I head back to the trail to think about how to find the caretaker without walking back too far, but amazingly he comes around the corner at exactly that moment! I make my request, and he goes one further and outright gives me a roll! It’s an absolutely monster roll that’s at least three inches in radius before flattening, but I don’t care: it’s saved me a lot of trouble. Reinvigorated from this unexpected bit of magic, I complete the remaining 1.8 miles to the road in 48 minutes, at the strong pace of 2.25 miles an hour. If I keep that up for the next 4.8 miles I can make my intended destination with a little time to spare. Naturally, the uphills start again and I fail to do so, but I do make it two miles further down and set up camp just off the trail and next to South Pond, so water’s readily available. Bugs are out but not too bad as I make dinner and go to sleep. I’d planned to wake up around 6:30, thinking to pack up and be out before anyone else can pass by. Since I’m two miles from a road (and shuttles from town wouldn’t arrive until far later) and four miles from the nearest shelter, I don’t really expect anyone until at least eight. It’s really strange, then, when someone walks by at 6:35 as I’m slowly thinking about getting up and says hi. You meet all kinds on the trail, I guess. After breakfast and packing up I head further south. 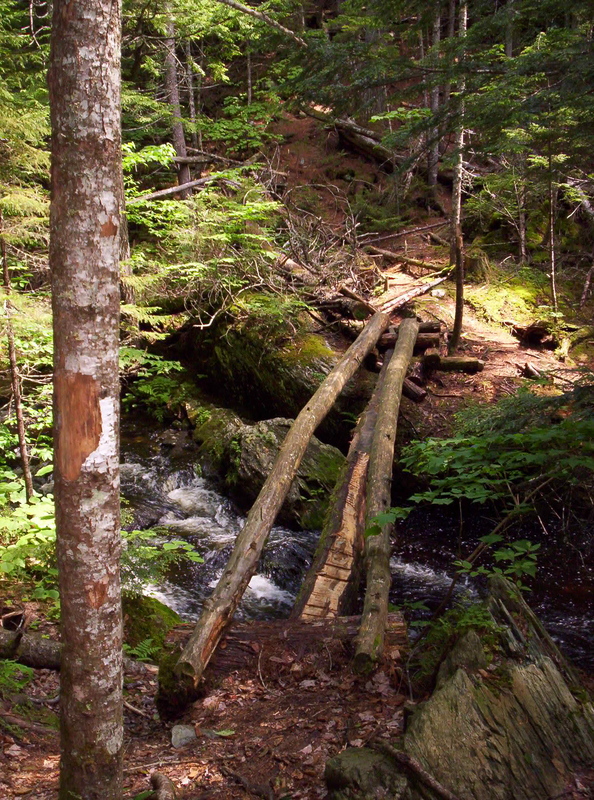 I don’t go far before I pass a treasure: a Maine map for the section of trail I’m hiking! 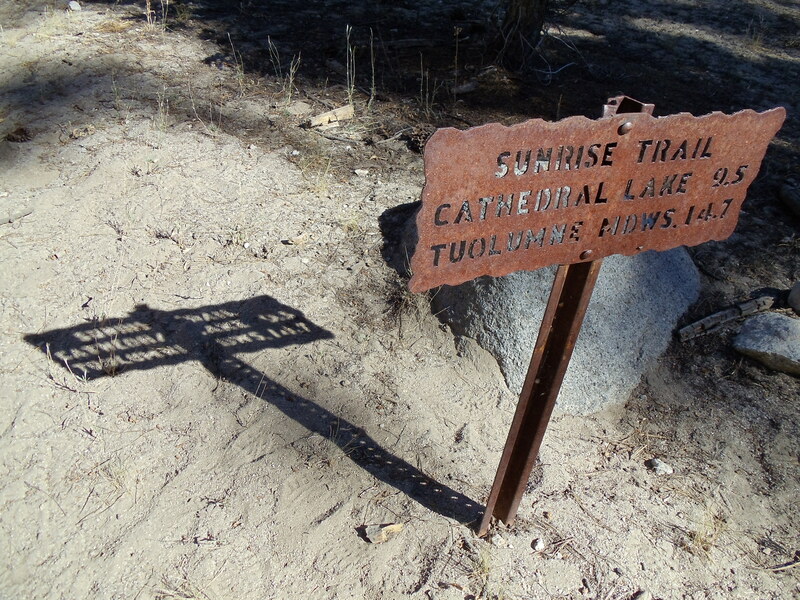 The Maine topos are pretty awesome: profiles, notes on trail features passed along the way, and so on. I haven’t bought them because they’re expensive, and many thru-hikers have done fine with trail signs combined with the white blazes on trees and rocks along the way. This map is only good another few miles, but I’ll take what I can get. It’s probably the early hiker’s map, but if it isn’t, I’ve got a nice shiny map (and if it is, he’ll be happy to get it). A few hundred yards later I stumble on an even better treasure: the map for the next section of trail. 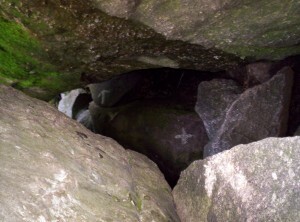 Again, it’s probably the early hiker’s map, but whatever: I have far-seeing guidance for a little while. 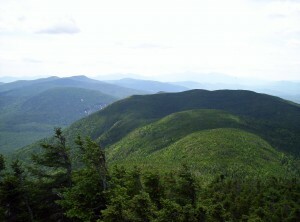 Later down the trail I meet another hiker heading north named Saxifrage (a thoroughly awesome name). 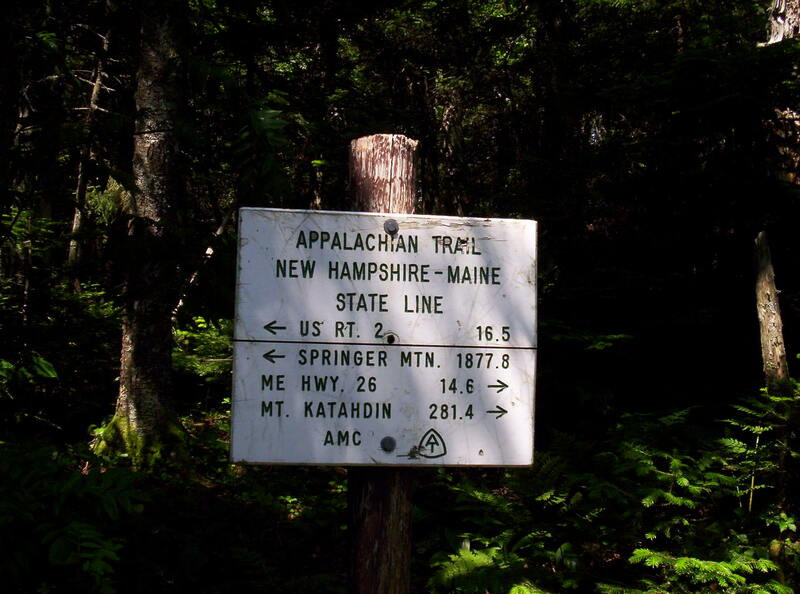 After inquiring where he’s heading to make sure he’s not doubling back for maps (he’s not), he mentions that a guy up the trail, a Seth of the American Hiking Society, had asked him to look for the maps. I tell him I picked up the maps and will pass them along when I see Seth. I eventually catch up to Seth at Sabbath Day Pond Lean-to, where I eat lunch and pass on the maps. He’s delighted and passes along contact info in case I need any trail magic in the D.C. area; we’ll see how I feel when I get there. The descent from crossing to ford is steep and takes a lot of time, so I decide to stop just after the ford and pitch the tent. 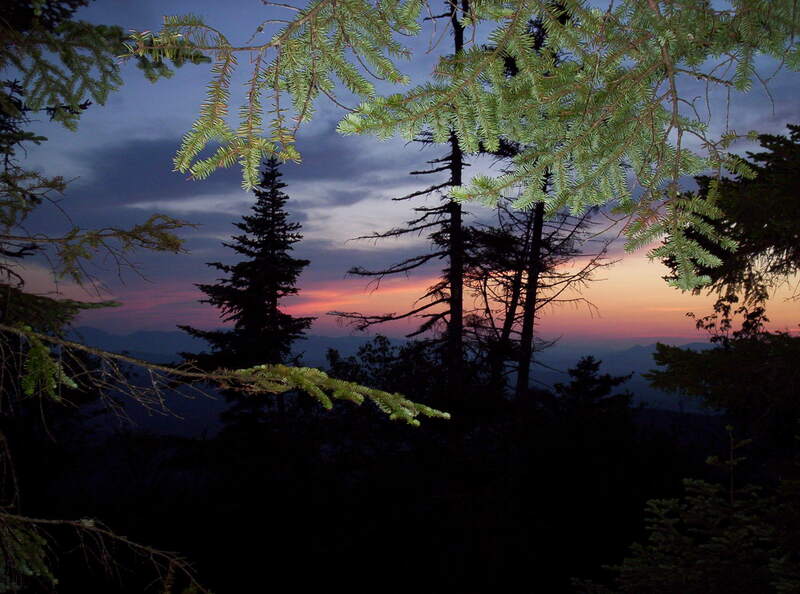 This isn’t actually a good idea: the bugs are the worst they’ve been since the one site in the 100-Mile Wilderness, and I pull out the raincoat and forego a cooked dinner in favor of energy bars and call it a night. Travel is fine until just before Old Blue Mountain at about ten miles in. I hope to go seven miles further to a shelter, but just then it starts to rain pretty hard, and even with a rain coat I’m completely soaked when I reach the top of the mountain. Since I’m just short of a road to Andover, I decide to stop there and hitch in to a hostel for the night — a birthday present, or something. The only problem is that the Companion says of the two roads into Andover that, “Neither road has much traffic.” I hurry as fast as I can and hope for the best. I reach the road at 20:15, at which point it’s not yet dark but is starting to get there. One vehicle passes heading in the opposite direction as I descend the last few feet to the road; I then wait fifteen more minutes, during which time exactly two vehicles pass heading in the direction I want to go. Miraculously (and I mean that in the literal sense) the second vehicle offers me a ride, next to their two dogs in the back seat of their pickup truck. They take me nine miles into town, and I arrive at the Andover Guest House at 20:52. I say hi to the hostel owners, who tell me I probably want to head over to the store across the street to get something to eat — just before it closes in eight minutes. (See what I meant about miraculous? You can’t cut it any closer than that!) I get food and eat it while talking to family back home on the phone; when the conversation ends I check email and deal with a post here while laundry cycles, then I head to sleep. 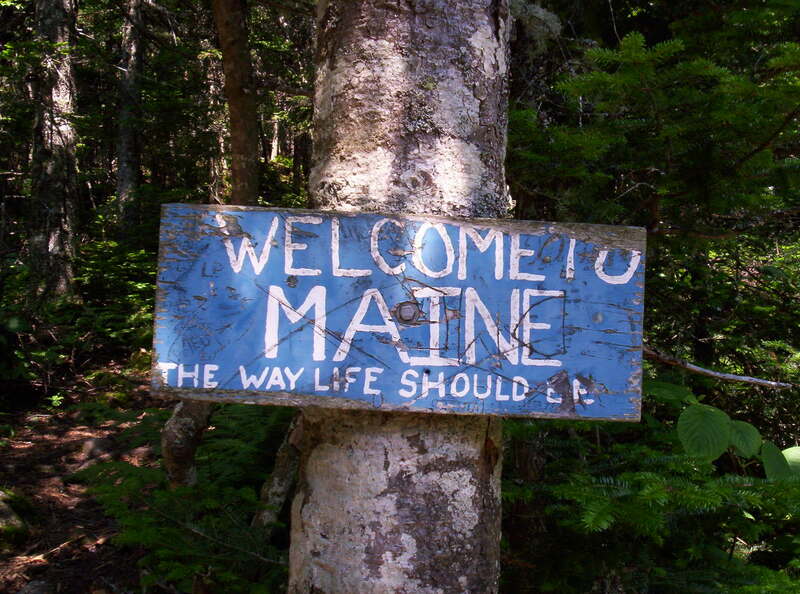 The main theme of southern Maine is that it’s a lot of up and down. 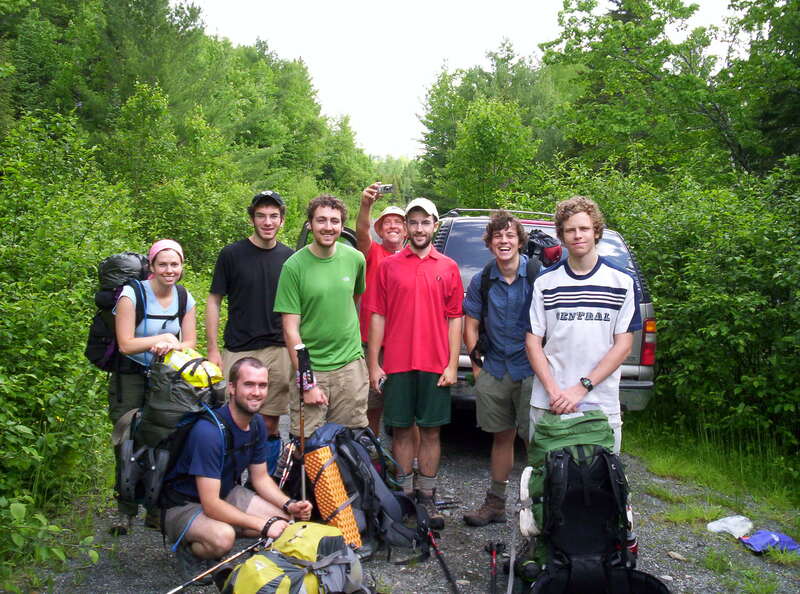 Northbounders are blowing past us, fresh from 2000 miles of hiking and the White Mountains as conditioning for the ups and downs (south of the Whites is actually considered pretty easy — the “hiker superhighway”, actually, where twenty-mile days are neither uncommon nor generally difficult if you get up early and keep a nice, long stride going), so their pace can be a bit depressing if you don’t take it in context. 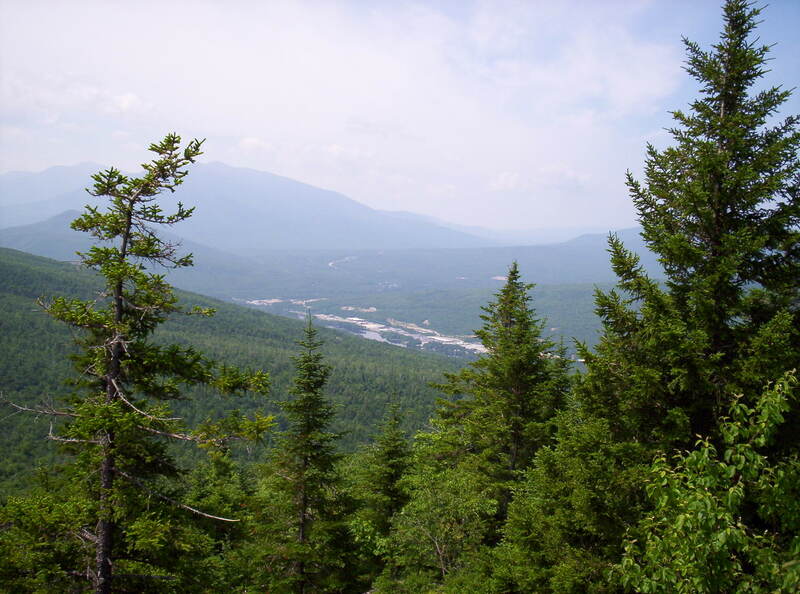 Right now I’m just anticipating Glencliff in New Hampshire, where, as I’ve been told by the two hikers at the lean-to just before Saddleback, the mountain climbing ends and the hiking starts.